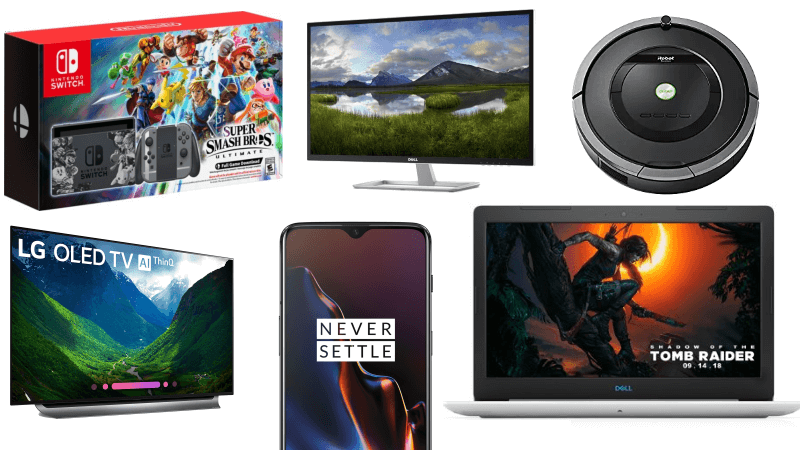 With the holiday season upon us -- and hopefully plenty of good deals to take advantage of -- we'll be circulating tech deal roundups gathered by our friends at TechBargains about twice a week. We'll make sure only the best deals (in our opinion) make it here so keep checking in the coming weeks for more. Today's highlights include a deep discount on a Dell 32" IPS monitor, 20% off Roomba's 801 Robot Vacuum and $300 off Dell's G3 hexa-core gaming laptop. $300 Off OnePlus 6T with Eligible Trade-in at T-Mobile. Dell G3 15 Intel Core i7-8750H Six-Core 15.6" 1920x1080 Gaming Laptop with GTX 1050Ti, Dual Storage for $729 at Walmart (list price $1099). Today Only: iRobot Roomba 801 Self-Charging Robotic Vacuum for $279 at Amazon (list price $349.99). 55" LG OLED55C8PUA 4K OLED UltraHD HDTV with α9 Intelligent Processor (2018 model) for $1599 at PCMag Shop (list price $2499.99). 65" LG OLED65E8PUA 4K OLED UltraHD HDTV with Glass Design and 4.2Ch Sound System (2018 model) for $2499 at PCMag Shop (list price $3499.99). Dell D3218HN 32" 1080p Ultra-Wide IPS LED Monitor for $159 at Walmart (list price $249). Alienware Aurora Intel Core i5-8400 Six-Core Gaming Desktop with 8GB GeForce GTX 1070 for $949.99 at Dell (use code: 50OFF699 - list price $1199.99). 55" VIZIO D55x-G1 4K UHD HDR Smart LED HDTV for $348 at Walmart (list price $478). Out Tomorrow: Nintendo Switch Super Smash Bros Ultimate Edition Console Bundle for $359.99 at Amazon. Dell G5 15 Intel Core i7-8750H Six-Core 15.6" 1920x1080 Gaming Laptop with 16GB RAM, 6GB GTX 1060 Max Q, Dual Storage for $1049.99 at Dell (use code: 50OFF699 - list price $1299.99). Alienware 15 Intel Core i7-8750H Six-Core 15.6" 1920x1080 Gaming Laptop with 16GB RAM, 6GB GTX 1060 OC, Dual Storage for $1349.99 at Dell (use code: 50OFF699 - list price $1799.99). Dell XPS 13 9370 Intel Core i7-8550U Quad-Core 13.3" 1920x1080 Laptop with 256GB SSD for $1149.99 at Dell (use code: 50OFF699 - list price $1469.99). Dell Inspiron 17 5000 Intel Core i5-8250U Quad-core 17.3" 1920x1080 Laptop for $629.99 at Dell (list price $799.99). Dell Inspiron 3650 Intel Core i7-7700 Quad-core Win10 Pro Desktop with GTX 1050, 16GB RAM and Dual Storage for $759 at Dell (use code: INSDT759 - list price $1109.99). Dell S2719DGF 27" 2560x1440 1ms FreeSync Gaming Monitor for $359.99 at Dell (list price $529.99). Microsoft Xbox One X 1TB Bundle + Red Dead Redemption 2 Special Edition + Bonus Controller + Xbox $5 Gift Card for $479 at Walmart (list price $603.96). Microsoft Xbox One S 1TB Bundle + Red Dead Redemption 2 + 2 Bonus Controllers + Xbox $5 Gift Card for $259 at Walmart (list price $403.96). Sony PlayStation 4 Pro 1TB Red Dead Redemption 2 Console Bundle for $399 at Walmart. 55" RCA RTU5540 4K UHD LED HDTV for $259.99 at Walmart (list price $699.99). 55" Samsung QN55Q7FN 4K UHD HDR Smart QLED TV (2018 Model) for $1297.99 at Walmart (list price $2299.99). 49" LG 49UK6300PUE 4K UHD HDR Smart LED HDTV with AI ThinQ + $100 Dell Gift Card for $399.99 at Dell (list price $599.99). 65" LG 65UK6300PUE 4K UltraHD HDR Smart LED HDTV + $200 Dell Gift Card for $799 at Dell (list price $1199). Anker Nebula Mars II 1280x720 Portable Projector with Dual 10W Speakers for $369.99 at Amazon (use code: BESTMARS - list price $499.99). Leelbox Amplified HDTV Antenna (Up to 60-80 Mile Range) for $7.99 at Amazon (use code: X96SBXD2 - list price $26.99). Out Tomorrow: Diablo III Eternal Collection (Switch) at Walmart and Amazon for $59.99 at Walmart. HyperX Alloy FPS Pro Tenkeyless 87-Key Cherry MX Blue Mechanical Gaming Keyboard for $49.99 at Amazon (list price $69.99). Silicon Power 128GB High Speed MicroSD Card with Adapter for $17.99 at Amazon (list price $24.99). Corsair K95 RGB Platinum Cherry MX Speed Mechanical Keyboard for $149.99 at Amazon (list price $199.99). WD Blue 1TB 3D NAND M.2 2280 Solid State Drive for $139.99 at Amazon (list price $189.99). WD Blue 1TB 3D NAND 2.5" Solid State Drive for $139.99 at Amazon (list price $199.99). Seagate Expansion 4TB USB 3.0 Portable External Hard Drive for $89.99 at Amazon (list price $119.99). Cooler Master ML240R MasterLiquid RGB AIO CPU Liquid Cooler (Supports Intel/AMD) for $88.99 at Amazon (Clip $15 Coupon - list price $119.99). DC Bench 4 Digital Variable Power Supply (0-30V/0-5A) for $47.29 at Amazon (use code: PX9H532H - list price $89.99). Samsung EVO Select 128GB MicroSDXC Card with Adapter for $24.99 (256GB for $60) at Amazon (list price $41.99). SanDisk Ultra 1TB 3D NAND SATA III 2.5" Solid State Drive for $143.99 at Amazon (list price $178.99). Samsung Gear S3 Frontier Bluetooth Smartwatch with Built-in GPS for $242.99 at Amazon (list price $349.98). Anker PowerPort+ 6 Quick Charge 3.0 60W 6-Port USB Wall Charger for $26.39 at Amazon (use code: ANKERB26 - list price $32.99). dodocool 7-in-1 USB Type-C Hub with SD Card Reader and 4K Output for $24.99 at Amazon (use code: WBMKYC28 - list price $49.99). Yale Assure Smart Lock with Apple Homekit and Siri Integration for $149.99 at Amazon (list price $219.99). Dyson Cyclone V10 Motorhead Lightweight Cordless Stick Vacuum Cleaner for $383 at Walmart (list price $499.99). Jackery 67,000mAh 240Wh Portable Power Station with AC Outlet, 2x USB Ports for $239.99 at Amazon (use code: TBECALES - list price $299.99). Eton American Red Cross Emergency Weather Radio with Solar + Crank Charging, Flashlight, USB Charger for $35 at Amazon (list price $69.99).